How do exchange rate pegged loans work? In mid December 2014 we launched a new loan type. We call it an exchange rate pegged loan. With this loan, the monthly repayments have the US dollar or Euro as the underlying base currency. This way borrowers and lenders can mitigate the exchange rate risk that is inherent to bitcoin loans. All payments however are still conducted in bitcoin only. In this blog post we describe in more detail how the pegged loans work. We have also added EUR as an underlying currency in the first half of 2017. 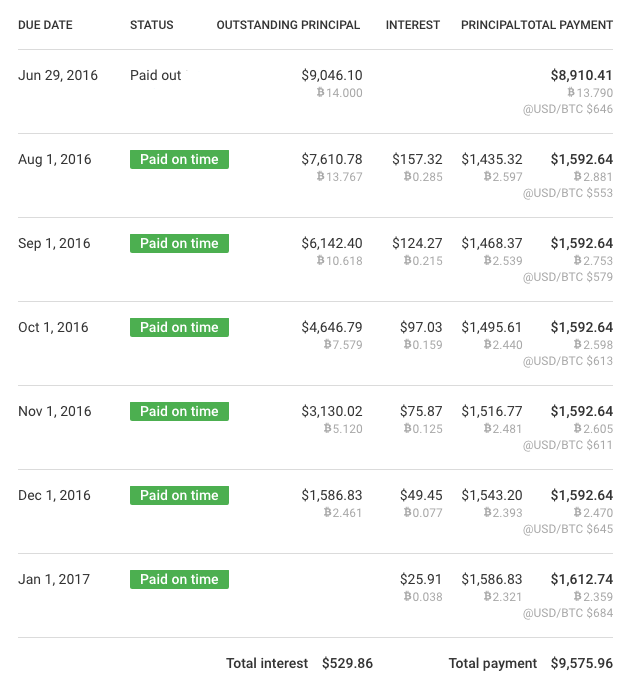 The basic columns of the payment schedule are identical to a loan where bitcoin is the base currency. The main difference is that all values are calculated in USD which is also called the base currency of this loan. The USD installment values remain the same throughout the lifetime of the loan, regardless of what happens to the exchange rate between bitcoin and the US dollar. When a payment is due, the total payment in USD is converted to bitcoins based on the current bitcoin USD price. That way the value of a monthly installment in USD is the same every month. The amount of bitcoin that gets repaid fluctuates along with the exchange rate. When the bitcoin price goes up during the lifetime of the loan, the amount of bitcoins that has to be repaid decreases. The reverse happens in case of a decreasing bitcoin price. The borrower decides how many bitcoin he likes to borrow. The USD equivalent value is displayed to the borrower before the loan is published to listings. Lenders review the loan listing, an example listing is shown below. During the auction the USD value of the requested amount fluctuates because the requested amount was set in bitcoin. Keeping the amount requested constant in BTC throughout the auction has the advantage that the number of notes a lender will hold is fixed. 1 note always represents BTC 0.01. When the loan gets funded the USD principal value of the loan is calculated. Based on this value we set up the payment schedule. The calculation of payments is exactly the same as when bitcoin is the base currency. In the above example the loan received funding of BTC 5.0. When we assume an exchange rate of 354 USD per 1 bitcoin, the loan has a principal value of USD 1,770. Note that we take a precise exchange rate with 2 decimals for all calculations. We just don’t display the decimals to save some space. All future BTC payments are forecast with the current exchange rate. That way borrowers and lenders have an estimate about how many bitcoins they are going to pay / receive. As stated above we always take the most precise exchange rate. That means we calculate with 2 decimals, even though we do not display them. Our source for the bitcoin price is BitcoinAverage. They have a cool API that returns the data-set that we use in JSON. One other thing to note is that we do not take the spot price. Instead we take the average price of the last 24 hours to calculate payments. This way we want to avoid heavy price peaks and drops that can happen at certain points in time. Exchange rate pegged loans are well suited for traditional loan use cases. If someone wants to finance a machine or working capital with the loan, the revenues are typically denominated in a fiat currency. In such cases exchange rate fluctuations represent an undesirable uncertainty to the borrower. This uncertainty is mitigated with pegged loans. It is important to note though, that with this type of loan lenders should instantly convert repayments into fiat. If you keep a major part of repayments in bitcoin, you will be subject to exchange rate fluctuations again. In such a case loans with base currency BTC would be a better fit.